Spring Bulb Troubles | Gardens Alive! Here's show to make sure your tulips, daffs and other Spring-blooming bulbs return year after year. Q. Hi Mike: Two years ago I planted daffodil and tulip bulbs in our shady yard. The first spring I had beautiful blooms, but last spring and now again this spring, I'm getting leaves but no blooms. What can I do? We're also having construction done on our house and I need to 'move' one of their flowerbeds. Will it be alright to put the bulbs in a temporary bed for a few months? Thank you! ---Quinn in Middle town, Delaware. A. Great timing, Quinn—this is the perfect time of year to help everyone out there properly perennials their Spring bulbs so that they can enjoy those beautiful blooms year after year. Several problems can cause greens returning with no flowers. My first thought is your avowed shade; if it's deep, deep, deep all a time darkness from evergreens overhead, your Spring bulb leaves aren't getting enough solar energy to form the following year's flowers. When you first purchased those bulbs a couple of Falls ago, the following Spring's blooms were already formed inside the bulbs; I always used to illustrate this wonderful fact of nature when I would do my annual Spring bulb bit on the Today show by cutting a bulb open to show the flower inside. So the first year's flowers are free. But then the bulbs have to get enough sun to form new flowers for the following year. Now, if your shade is from deciduous trees, you should be fine—by the time they fully leaf out in the Spring, your bulbs should have gotten all the sun they need. The solar energy angle also comes into play when people cut their bulbs back to the ground right after they flower. If you have a fast hand with the clean up, the bulb itself may survive, but it won't be frisky enough to make a new flower. It's always a good idea to remove the faded blooms and any seed heads that form on your plants, but you have to leave the leaves in place until they lose their rich green color to get future flowers. That's why I like to plant my bulbs so that later bloomers like tulips come up in front of the really early ones like daffodils—the new flowering plants nicely hide the fading foliage of the old ones. Incorrect feeding is a third big potential reason. Bulbs need food, just like other plants—but people often give them the wrong kind of food. You know what they say—"too much nitrogen and not enough phosphorus makes Jack a dull boy"! OK, so nobody says that. They should! 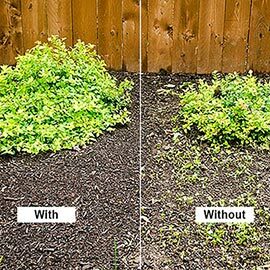 Anyway, if you overfeed ANY flowering plant a nitrogen rich fertilizer—like manure or a packaged fertilizer with a high first number on the label—you'll get lots of lush green growth, but no flowers. 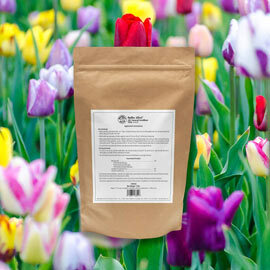 Fertilizing 101: All packaged fertilizers, chemical or organic, will have three numbers on the label that refer to their relative amounts of the three main basic plant nutrients, Nitrogen, Phosphorus and Potassium (which old-timers love to call 'Potash'), abbreviated N-P-K. In the simplest sense, N grows big plants; P stimulates flowering and fruiting; and K builds strong roots. Over many, many years—generations in fact—premier Spring Bulb enthusiast Brent Heath of Brent & Becky's Bulbs in Gloucester, Virginia, has found that bulbs like a little bit of Nitrogen, a fair amount of phosphorus and a LOT of potassium (which, being a fellow old guy, he calls potash). After all, he reminds me, a Spring bulbs is essentially just one big root! Brent adds that his years of experience have shown compost to be the best bulb fertilizer. He says he just mixes a lot of that fine organic matter into the soil when he plants his bulbs and the results are spectacular. Brent adds that bulbs also need adequate moisture to develop future flowers. This would have been a problem in your area during the three-year drought we East Coasters endured a while back, but the last two years have been fiendishly wet; and that may also be the problem. If your bulbs are planted in heavy clay soil that's been water logged the past couple of wet, wet Springs, you're lucky the bulbs haven't trotted, much less flowered. And finally, my pals at the Netherlands bulb information center add that compacted soil could also be the problem; don't be walking over top of where your bulbs are sleeping! And, I'll add that you're impatient! It's much too early in the season to decide that you won't get any flowers this year—especially from your tulips; the entire Northeast has been cold and wet and everything—Spring bulbs, flowering shrubs and trees—is running late. Now, if you truly DON'T get blooms this year, shovel some compost around the plants and leave those leaves alone until they turn yellow. Then, yes—do dig them up and move them to another area for your construction. Find a nice sunny, well-drained spot, amend the soil with lots of good quality compost, plant them there, and then LEAVE them there. In gardening, as in real estate, location is everything.